Can you make soap from (fill in the blank)? Soapmakers love the challenge of making soap from exotic fats and oils, but they can also change up the “water portion” used to make their lye, substituting milk, tea, coffee, floral water or any other aqueous concoction capable of dissolving sodium or potassium hydroxide. 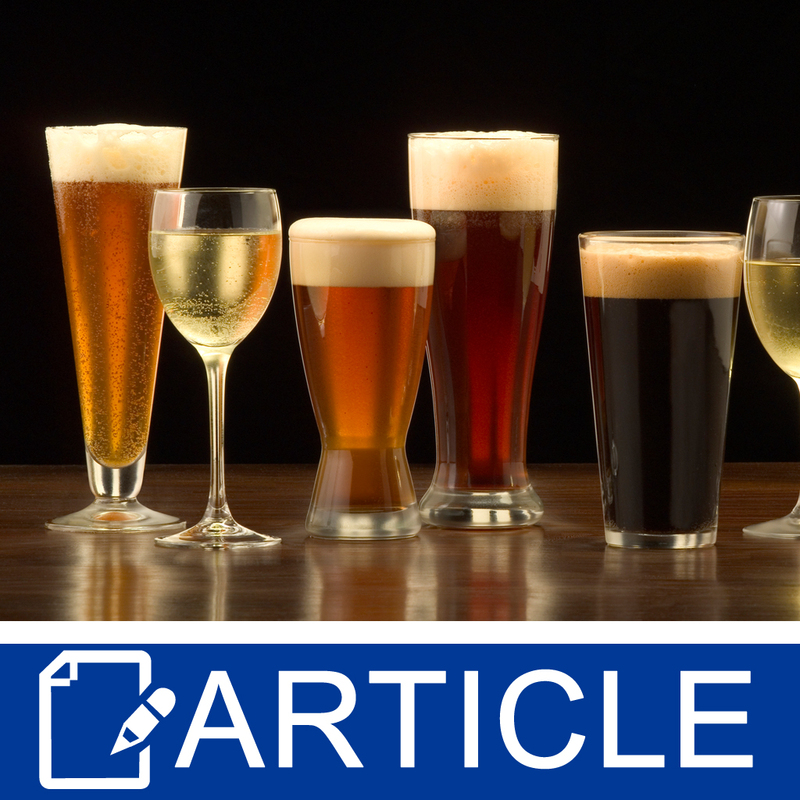 This month, we look at alcoholic beverages. The main difference between alcoholic beverages and these other watery choices is that they contain, well, alcohol. 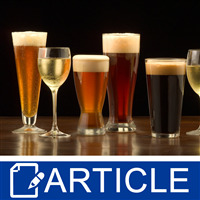 To make matters confusing, the word “alcohol” can mean any of several things, and the alcohol of “alcoholic beverages” goes by several different names. Alcohols are actually a class of compounds, all of which contain at least one OH group (in addition to the usual carbon and hydrogen atoms). The simplest alcohol is methyl alcohol, also known as methanol, with formula CH3OH. The next simplest alcohol is ethyl alcohol, also known as ethanol or grain alcohol, with formula C2H5OH. Alcoholic beverages are mostly water and ethanol. Beer is typically 1-6% ethanol, wine 9-15% and hard liquor 30-40%. Even at its highest concentration, beverage-grade grain alcohol contains 95% ethanol (190 proof) and 5% water. Methanol and ethanol are just the first two of a very large family of compounds. Isopropyl alcohol, C3H7OH, is known as rubbing alcohol. Propylene glycol, C3H6(OH)2, is a common ingredient in cosmetics and is one of the more popular carriers for e-cigarettes. Glycerol, C3H5(OH)3, is the well-known byproduct of saponification. Sugars like glucose and sucrose have multiple OH groups, and so belong to this alcoholic family, as does any chemical whose name ends in “ol,” for example, cholesterol. Since they contain both hydrophobic carbon chains and hydrophilic OH groups, alcohols have surfactant properties similar to soap itself. We find them in many products where it is desirable to emulsify fatty and aqueous components. But for soapmakers, grain alcohol may promote the emulsification of oil and lye, perhaps leading to an undesirably quick trace. If we make our lye solution from beer and wine, will the alcohol boil away, or will it remain in the lye solution? Rather than just give you the answer, I would like to teach you to answer the question for yourself. You might think that you need some fancy laboratory equipment to answer this question, but we can get quite far using only a scale. We will mix lye with wine, beer, and water, comparing the total weights before and after mixing. For this experiment, I used a scale with a resolution of 0.01 grams and a capacity of 1000 grams. I decided to make batches of 150 grams—much larger than the resolution and comfortably lower than the capacity of the scale. Using 100 grams of liquid and 50 grams of sodium hydroxide gave me a lye concentration of 33%, one commonly used by soapmakers in practice. And with 100 grams of liquid, the conversion to percent alcohol was particularly straightforward. I began by placing a beaker on the scale and pressing the tare button. I then added 100.00 grams of liquid (wine, beer or water) to this beaker. I tared a second beaker and added 50.00 grams of sodium hydroxide to it. With both beakers on the scale, I pressed the tare button, and the scale read 0.00 grams (Figure 1). Finally, I added the sodium hydroxide to the liquid in the first beaker and returned the empty second beaker to the scale. The scale still read 0.00 grams, but as the sodium hydroxide solution began to heat up, some of each liquid began to evaporate, and the scale registered a loss of weight. Upon mixing, the wine came to a boil (Figure 2). It lost 8.06 grams by the time the boiling ceased (Figure 3), and lost a total of 10.27 grams by the time it cooled to room temperature, that is, 10.27% of the original liquid weight. The beer was still carbonated at the beginning of the experiment. As the solution warmed, it began to boil, releasing both carbon dioxide and ethanol vapor. By the time the solution cooled to room temperature, it had lost 5.95% of the original liquid weight. The water did not boil as the sodium hydroxide dissolved, but it did lose 4.27% of its weight to evaporation. The most alcoholic liquid lost the most weight, but since the wine started out at 12% alcohol, it is clear that some alcohol must have remained in the finished solution. The smell of alcohol confirmed this conclusion. With an initial alcohol content of 5.5% and a loss of 5.95%, the beer would appear to have lost all of its alcohol. But considering that the water lost 4.27% without even boiling, it is likely that the beer lost some of its weight due to the evaporation of water. Thus some ethanol may remain even in the beer lye. Is there enough ethanol remaining in wine or beer lyes to cause rapid trace? That sounds like another experiment for you to perform. You may have no problem, but if you do, there are several remedies. You could increase the portion of slow-tracing oils in your oil blend. You could boil the wine or beer to remove some of the ethanol prior to mixing your lye solution. You could freeze your wine or beer, discarding any unfrozen liquid (the portion high in ethanol), but both boiling and freezing add time and expense to your process. You could start with non-alcoholic wine or beer, but this limits your choice of beverage. Diluting wine or beer with water would preserve their label appeal while decreasing the amount of ethanol in the lye solution and decreasing your material costs. And you can even add wine or beer to pre-mixed lye solution made with water, thus saving you additional time waiting for your lye to cool. If your formula calls for 12 ounces of sodium hydroxide, for example, you could use 24 ounces of 50% lye solution and 12-18 ounces of wine or beer, resulting in a sodium hydroxide concentration of 33%-29%, respectively. These alternatives give you options for finding a formula that works for you.